Edward Malone, a young reporter on the Gazette, asks his beloved Gladys Hungerton to marry him but she is only interested in having a hero for a husband. However, she hints that she might accept his proposal if he becomes famous, so Malone dashes off to the newspaper offices to get a dangerous assignment that will prove he is worthy of her love. His boss, a Scotsman named McArdle, suggests that Malone expose the eminent but irascible Professor Challenger as a fraud. There's been a controversy over the professor's expedition to South America and he's now refusing to meet the press, resorting to violence when crossed. After consulting his friend, Tarp Henry, Malone writes a letter to Challenger pretending to be a student admirer and asking for clarification on a contentious paper Challenger has presented. He gets a typically arrogant reply in return but the professor does agree to see him. When he arrives at Challenger's home, the vivacious Mrs Challenger takes Malone to one side and warns him about her husband's temper. The warning does no good as the professor lives up to his fiery reputation and physically attacks Malone, having exposed him as an impostor. Their struggle sends them tumbling into the street but Malone refuses to press charges when a policeman comes on the scene and he is invited back inside. Challenger and his wife argue over his unreasonable behaviour before he and Malone retire to the study. He says he will tell Malone what happened in South America but only if the reporter promises to tell no-one else. Challenger shows Malone a notebook by a dead American explorer called Maple White that he came across during his travels. 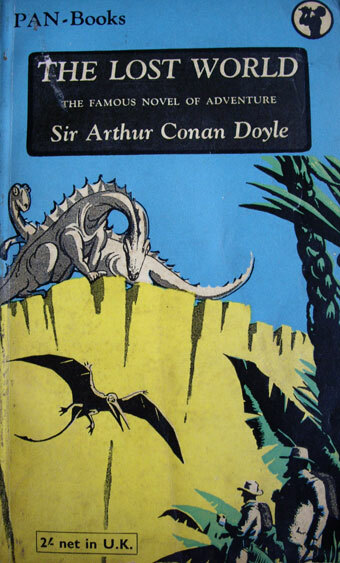 It contains intriguing pictures, including one of a stegosaurus which Challenger is convinced was drawn from life. He traced the source of the drawing to an isolated plateau in the interior where he saw and shot a pterodactyl. However, his photographs were ruined when his canoe capsized and he's only got a fragment left of the reptile's corpse. He doesn't think he has enough to convince a sceptical public that prehistoric creatures still exist. However, Malone believes him and Challenger invites him to the Zoological Society that evening where he plans to present his controversial theory. Challenger is only supposed to give a simple vote of thanks to a visiting speaker at the meeting and there is uproar when he launches into an attack on his fellow scientists and insists that live dinosaurs can still be found. As his own accounts are not to be trusted, it is agreed that three representatives from the audience will test his findings on behalf of the Society by going out to South America. He will provide them with a map. The three are Professor Summerlee, a scruffy, sneering academic, Lord John Roxton, a dashing explorer and slayer of slave traders, and the excitable Malone, who sees this as his big chance to impress Gladys. Malone makes arrangements with McArdle for reporting the story while he is away, Challenger gives the trio their final instructions and the three set out from Southampton for the first leg of their journey. When they reach Brazil, men are hired to carry the supplies. These include some Native Indians, a gigantic black man called Zambo and two men of mixed race, Gomez and Manuel. Challenger himself turns up unexpectedly, much to Summerlee's annoyance, and the party head for the interior, first by river steamer and then by canoe and foot. With the professors continually bickering, the travellers journey through a variety of terrains, until they reach the red cliffs of the plateau Challenger had previously visited. Unable to climb the cliffs at the nearest point, the group decide to walk round, looking for a route up. Along the way, they find the skeleton of a man who seems to have been thrown from the cliffs. White has left clues that guide them into a cave that must have been the route he took, but the path has been blocked by a rock-fall. While they make their way back to the cave entrance they are nearly crushed by a falling boulder. They make a complete circuit of the cliff base and Challenger next suggests they climb the column of rock that stands adjacent to the cliffs. When they reach the top they make a bridge across the chasm by felling a tree. However, the four travellers are trapped on the plateau when the bridge is destroyed behind them by Gomez in revenge for Lord John's killing of his brother during the slave wars. He is shot dead by Lord John. The four build a camp for themselves and, while the other bearers run off, the loyal Zambo remains within hailing distance across the chasm. The men start to explore. Among their discoveries are a family of peaceful iguanodons and a rookery of pterodactyls, which attack them. When they get back to camp later that day, they find their stores have been ransacked. The following night they hear the terrible sound of one dinosaur being killed by another and catch a glimpse of a ferocious carnivore. They spend another day exploring - coming across the bloody remains of last night's attack - but Summerlee insists they make plans to leave rather than explore further. Malone suggests he climb the huge tree at the heart of their camp so he can draw a map of the area for future reference. Climbing the tree he is shocked to encounter an ape-like human who leaps away from him with a look of hatred. Among the points Malone refers to on his map is a lake he names after Gladys and that night, while the others sleep, he decides to walk to it. He sees the lights of fires in cave mouths across the water. 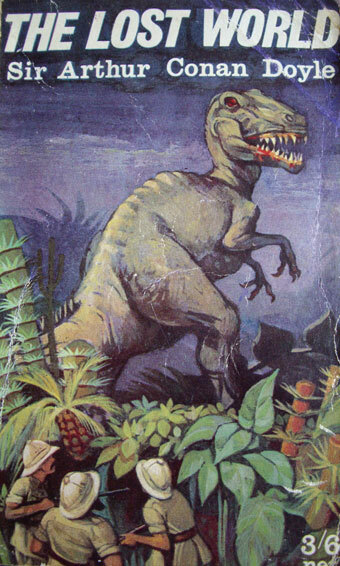 On his return through the forest to the camp he is chased by a dinosaur and falls into a man-made trap. He is unable to get back to the camp until dawn. He finds signs of a struggle and his companions are missing. He spends a restless day and night and is awoken the following morning by a dishevelled and desperate Lord John. He tells Malone how the camp was attacked by the ape-men. The three of them were carried off to the ape-men's village and witnessed Indians being thrown from the cliffs. It was clear that Challenger and the others would be killed that day. Lord John had managed to escape but he and Malone must return to save their companions. They do so and also rescue four of the captive Indians. One of the Indians they rescue is later killed by the ape-men, but the rest are safely reunited with their tribe. The four agree to help the Indians in a final, decisive battle against the ape-men. The night before, they enjoy the wonders of the lake. The battle is fierce and both sides are ruthless, but in the end the Indians are victorious. Now the centuries old conflict has been settled, Summerlee insists they make plans to get back home, despite the Indians' hospitality. Malone describes some of the things the travellers saw on the plateau while they waited for a chance to get away. Challenger plans to escape using a gas balloon, but his design needs more work. However, one of the Indians secretly gives them a sketch showing a route down to the plains through the caves and they are at last reunited with Zambo. A search party is waiting for them. Back in London, Malone reproduces the newspaper account of the meeting of the Zoological Society and the sensation caused by the pterodactyl the travellers brought back with them. He goes to see Gladys and is appalled to find she has married a humble clerk. Lord John shares out the fortune he has made from the diamonds he found in the volcanic mud on the plateau. Challenger and Summerlee plan to use their share to fund their research interests. Lord John will use his to mount another expedition and Malone says he will join him. There is a shorter summary with chapter-by-chapter questions available on the Downloads page. 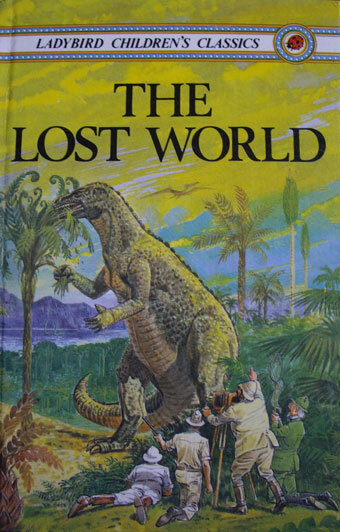 You can find out about some of the real-life inspiration behind The Lost World and about British science fiction in the readers' guide on the Downloads page. 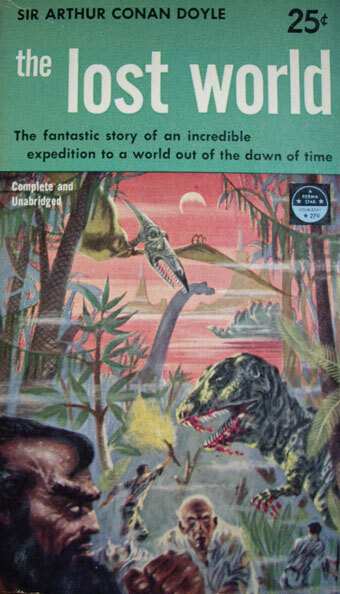 Covers of The Lost World from the 1950s and 1960s (private collection).